There are many ways to define a trail gun, largely depending upon the reason that you find yourself on the trail in the first place. Many people take to the trails every year without even the thought of the possibility of needing a gun. This seems reasonable enough, as many of the so-called trails upon which people traverse are nothing more than glorified dirt sidewalks. These trails are mostly used by people who, for whatever reason, like to leave the apartment and drive the SUV to the edge of town to enjoy the experience of a walk upon the local hiking trail. They park alongside the other Volvos, Outbacks, and Tahoes. They grab their designer coffee, tie the sweater around their waist and commune with nature. I could make a good argument that these people also need a good sidearm when walking the civilized trails of the local suburban park, but that is not the substance of this article. The definition of a trail for our purpose is not so much a path upon which to walk, but a much more remote destination, chosen for the very reason that it is remote as much as anything. In short, it is about going where people ain't. The reason for being in the outdoors can define the need for or design of a trail gun, as much as the surroundings themselves. A deer hunter may or may not have a need for trail gun in addition to his primary weapon. A trail gun, to me , is the gun which you carry when doing something else. A tool to ride unobtrusively on the hip or in the pocket to fill the job when the need arises. A man enjoying fishing a stream on Alaska's peninsula probably needs a different trail gun than than someone digging ginseng roots in the woods in Tennessee. I think that for most of us, the trail gun will be carried either when we don't need a gun, or in addition to the primary weapon. A 30-06 bolt-action would be plenty powerful to dispatch a late season timber rattler, but seeing a snake at ten feet through a four-power scope could be difficult. Even if you could focus on the snake, trying to place the crosshair on his moving head while screaming like a woman and urinating on oneself can be very distracting. It would, however, be an easy shot with a revolver loaded with a shot cartridge. That same rifle, while ideal for a two hundred yard shot at a whitetail, would be a bit much for a gray squirrel feeding under an oak tree at 30 paces. You could have plenty gravy, but it wouldn't leave much of anything that resembled meat. A 22 caliber hollowpoint from a four inch revolver would insure that not much was wasted. Also, a man traveling in what is left of bear country, the few places where the possibility of running across a really dangerous bear is real, would arguably be better served with a powerful but handy rifle, such as the short Marlin 45-70 lever gun. He too, could use a light, handy trail gun for the occasional rogue chipmunk that might terrorize the camp, or to put some small game in the pot. The trail gun should be small enough that you will have it with you when the need arises, and powerful enough to fill the job. That brings me to the subject of this article. I hereby nominate for the position of all-around ideal trail gun a handgun that has been out of production now for a couple of years. 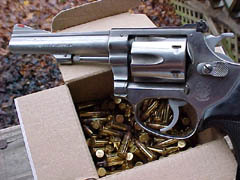 The Smith and Wesson model 63, also known as the stainless 22/32 Kit Gun. 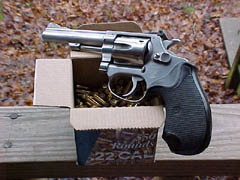 The model 63 was Smith's stainless version of their model 34. It was introduced in the late 1970's, and discontinued a couple of years ago when they brought out the small aluminum .22s. The model 63 has just the right heft to it to make it steady in the hands for accurate shooting, but light enough to carry on the hip all day almost unnoticed. The 63, like the model 34, was offered with either a two-inch or four-inch barrel. The four-inch offers the ideal combination of portability and practical accuracy. Built on the J-frame, the 63 is much more compact than the models 17 and 18, which are built on the larger K-frame. The K-frame guns, while accurate and strong, do not offer the same combination of portability and handiness of the 63. The model 34, on the other hand, while being the same size and weight as the 63, does not have the advantage of stainless construction. For a gun that will be constantly worn in a holster, in any weather, stainless steel has the advantage of durability and ease of care that a blued gun just can't match. Now for the cartridge. The model 63 is chambered for the .22 long rifle, the most prolific cartridge in the world. This little round performs way out of proportion to it's diminutive size. It can readily dispatch any small game and varmints, and provide lots of plinking enjoyment for almost no cost. A 500 round brick of ammo can be had for less than 50 rounds of the centerfire stuff. The .22 round is so affordable that a person can get all the practice they need to become really good with the little Smith. And when needed, if the shooter does his part, the little .22 will get the job done. Even though this gun is out of production, it is still in demand. If you can find one for sale, they bring premium prices. Maybe someday, if the company can survive, Smith and Wesson will get out of the gun control business and back into the gun business. As this is being written, our republic awaits the recount of the Florida presidential vote. The outcome could determine the fate of Smith and Wesson and our gun industry in general. The Smith revolver is to good of a design to be lost to politics. For hunting big game and for protection against man or beast, I greatly prefer a good rifle or a magnum handgun. 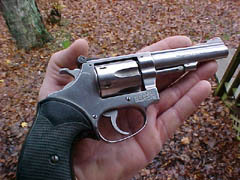 But, for a go-anywhere, everyday companion in the woods, you can't beat the Smith and Wesson Model 63, the Little Big Gun. Smith & Wesson Model 63, the stainless .22 "kit gun"